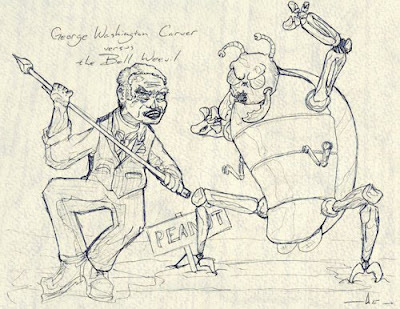 George Washington Carver has been a hero of mine since I was about 8 years old and I first read about him. The way the grade school biography was written made it sound like he pretty much had comic book super powers and saved the lives of everyone he knew, the South, America, and humanity at large. Now I know the part about super powers isn't true. I'm sorry if anyone sees me arming Carver with a spear as a racial stereotype. Besides, that's on you, you racist. In fact, I've been watching a lot of wushu videos and a spear just seems like a good weapon for fighting an enormous six-clawed monster. It's what I'd want in the same circumstances. You have distance, power, speed, and stabbing. Plus they're out in the open so you can really whirl that bad boy around. Still I suppose I could've given him the punnish kitchen knife and avoided all this disclaimer.